Summary: In this richly layered debut novel, Cate Campbell introduces the wealthy Benedict family and takes us behind the grand doors of their mansion, Benedict Hall. There, family and servants alike must face the challenges wrought by World War I--and the dawn of a new age brimming with scandal, intrigue, and social change. Seattle in 1920 is a city in flux. Horse-drawn carriages share the cobblestone streets with newfangled motor cars. Modern girls bob their hair and show their ankles, cafés defy Prohibition by serving dainty teacups of whisky to returning vets--and the wartime boom is giving way to a depression. Even within the Benedicts' majestic Queen Anne home, life is changing--above and below stairs. Margot, the Benedicts' free-spirited daughter, struggles to succeed as a physician despite gender bias--and personal turmoil. The household staff, especially longtime butler Abraham Blake, have always tried to protect Margot from her brother Preston's cruel streak. Yet war has altered Preston too--not for the better. And when a chance encounter brings a fellow army officer into the Benedict fold, Preston's ruthlessness is triggered to new heights. An engineer at the fledgling Boeing company, Frank Parrish has been wounded body and soul, and in Margot, he senses a kindred spirit. But their burgeoning friendship and Preston's growing wickedness will have explosive repercussions for everyone at Benedict Hall--rich and poor, black and white--as Margot dares to follow her own path, no matter the consequences. I’m still a sucker for books that tout themselves as Downton-esque so I picked this one up & dove right in. 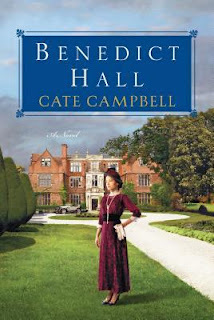 Set in Seattle just after WWI the story takes us to Benedict Hall & the family & servants who reside there. I won’t spoil here but I will say this, I liked Margot and that she was a doctor quite determined to practise when it wasn’t considered a proper job for a woman. She was smart, sometimes awkward, most often sensible and very relatable. I also liked Frank Parrish, the Major back from the war where he’d lost an arm. He never gave up and despaired and still remained kind even when he was feeling ill at ease or unsure of his place in the world. I had no problem investing in and rooting for the two as a couple. Preston was a nasty piece of work but he kept me page turning in a macabre way. I still want to know what made him so hateful and twisted. Margot is quite clear about him always having been that way and having tried multiple times when they were children to kill her with Blake being the only thing that stood in his way. So, I wondered what happened to make him that way. It’s not answered but I hope there’s some further insight in the next book (which I have on my desk to read). I’m still not sure how I feel about what is hinted at as his fate and I really didn’t know what to do with the “mystical sapphire” turn but still, I enjoyed reading this story for the most part. The scene setting was well done & gave a clear picture of Seattle at the time. I’d recommend this to anyone looking for another series to get into. It’s a fairly quick read & engaging enough to breeze through on the weekend. A 3.5 star read for me.